Food for the mind was an idea conceptualized by Nyambura Maina, together with the late Louisa Gikonyo, Wairimu Gitonga, Ndunge Mavuti and AHS old boys: Nduranu Kiiru (current OBC Chair), Martin Mbaya, Eric Gitonga, Richard Kioko Kiundi and Segeni Ng’ethe. Nyambura inspired us to raise cash to donate books to AHS. We decided to buy books which we felt we should have read in high school, giving the opportunity to students today to benefit from our wisdom of book choices. In addition to our own ideas, we ran a survey amongst old boys and friends asking the question ‘What 5 books do you wish you read in high school?’ We received many helpful responses from old boys like Arthur Adeya (Deputy School Captain 1991), Lawrence Riungu (Chapel Prefect 1994), Shem Yator, George Ogutu (94), Arkanjelo Paul Lorem, Vasquo Lordez and AGHS old girl Kui Wacieni (94) amongst others. In total we bought 255 books and 22 magazines. These included books like ‘God Of Small Things by Arundhati Roy, Fountainhead by Ayn Rand, A Short History Of Nearly Everything by Bill Brason, Oliver Twist by Charles Dickens, Purple Hibiscus by Chimamanda Ngozi Adiche, Love In Time Of Cholera by Gabriel García Márquez, Harry Poter by JK Rowling, Good To Great by Jim Collins, A Bend In The River by VS Naipul, Steve Jobs by Walter Isaacson, Unbowed the autobiography of Wangari Maathai and many more. The full list of books and magazines we donated can be found here. 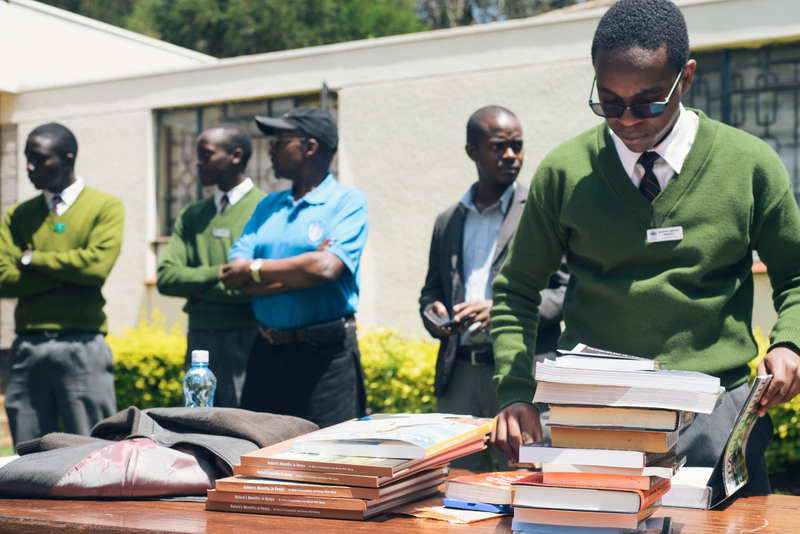 The chair of the Board of Management Mr Donald Kaniaru, an avid reader himself, was the guest of honor during the book donation on April 8th 2014.